FEBRUARY 8, 2018: The state’s Group Insurance Commission has unanimously approved health insurance plan design for FY19, covering all six carriers and slightly lowering costs for some enrollees. Heeding calls from Mass Retirees and all public employee/teacher unions, copayments and deductibles will not increase for the coming year. With the official news this fall that Social Security would be paying a 2.0% COLA (Cost-of-Living Adjustment) in 2018, members may have been looking forward to some extra money in their SS check. This 2% COLA will produce an average increase of $27 in monthly SS benefits next year. 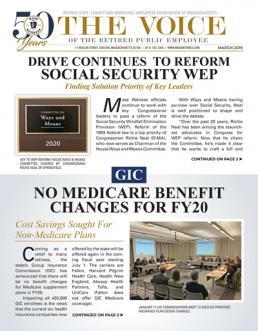 The September edition of the Voice not only captured the attention of Association members, but also that of elected officials and the state’s Group Insurance Commission (GIC). Beginning this past July 1, the GIC’s SilverScript prescription drug program has expanded its enrollment. In addition to OME (Optional Medicare Extension) enrollees, SilverScript now provides prescription drug coverage to those retirees enrolled in the GIC’s Harvard Medicare Enhance, Health New England MedPlus and Tufts Medicare Complement plans. October 17, 2017: It’s now official. Just yesterday the Social Security Administration (SSA) announced that the 2018 COLA (Cost-of-Living Adjustment) for Social Security beneficiaries will be 2.0%, starting with benefits paid this coming January. This 2% COLA will produce an average increase of $27 in monthly SS benefits next year. As printed by the Washington Post, March 24th. Is the Republican health-care plan a return to freedom or a watered-down version of Obamacare? Will Republicans placate their base with a major legislative achievement, or will this be the party’s undoing for a generation of voters? During his presidential campaign, Donald Trump was largely silent on Medicare, though he often suggested he’d leave the program untouched. Not any more. It now looks as if Trump may push for major changes in the principal health care program for older adults and some younger people with disabilities. But what will he do?